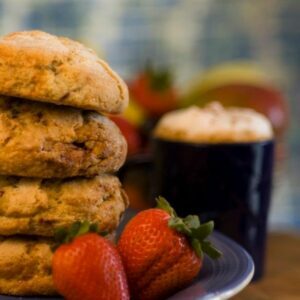 Scuffins - Dr. Insomniac's Fine Coffee, Tea, Smoothies Cafe | Where quality never sleeps!Dr. Insomniac's Fine Coffee, Tea, Smoothies Cafe | Where quality never sleeps! The Scuffin(c) The Best Part of a Scone and the Best Part of a Muffin. Part Scone Part Muffin Completely Delicious! NO trans fats and baked all day long in our in-house kitchen. Often times our shop will be filled with the aroma of fresh baked goodies being taken out of the oven waiting to be served fresh and warm. We have many flavors to choose from and have new combinations often. Some of our most popular flavors include: Blueberry & Cream Cheese, Strawberry & Blueberry, Blackberry & Almonds, Blackberry & Peach, Blackberry & Strawberry, Pumpkin & Cream Cheese, Chocolate Chip. Whether you would like to serve some upscale treats at your next event or would like us to design a catering tray for your next meeting our staff of dedicated individuals will be able to assist you in satisfying your specific needs. Simply call our customer service number to find out more about how we can help you.